We wargamers seem to be split at times into two camps. First, we have the generation that grew up on computer wargames. Second, we have the grognards that cut their teeth on board wargames before they found computer ones. 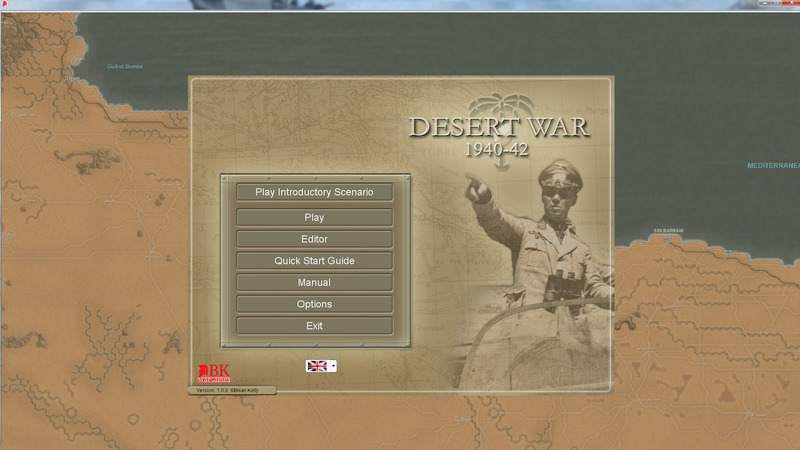 To me, Desert War is very much like a board wargame ported to the computer, and not a game that was built from the ground up as a computer game. This, I think, is where the almost Jeckyll and Hyde reviews of this game have come from. The younger computer generation seems to find the game hard to get into and the UI not user friendly, while those of us who have manually picked through stacks to figure out battle odds are more at home with the game and how it plays. I know I am over simplifying each side of the argument for length's sake. "Air, Naval, and Ground Assets are off-map capabilities that can be brought into play when the owning player sees fit. 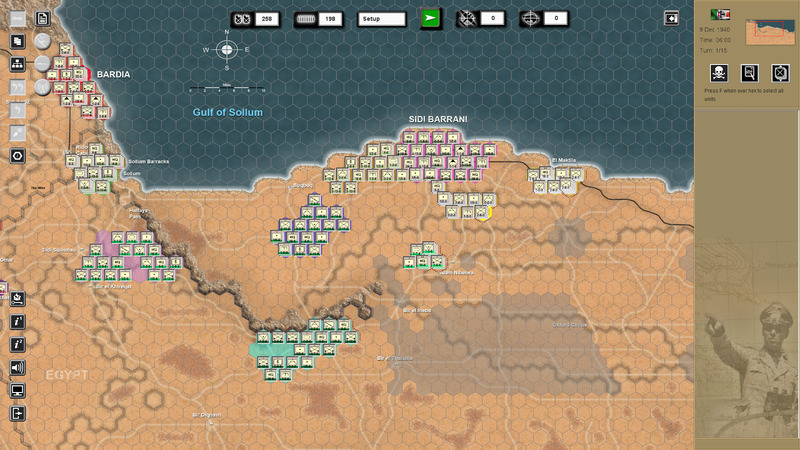 2nd Alamein: From Lightfoot to Supercharge, 24 Oct - 3 Nov 1942"
So the first thing to notice about the game that it is a WEGO, and not a IGOUGO game. 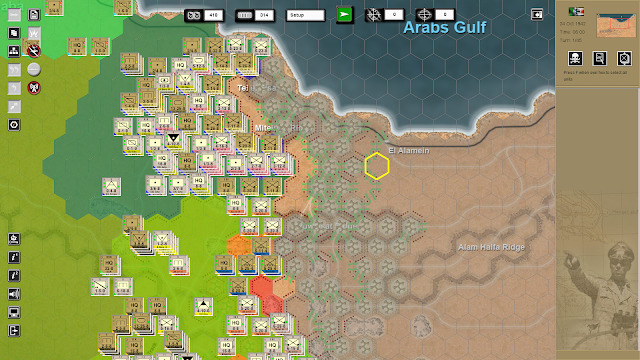 This type of action is where a computerized wargame really shines. To those unfamiliar with the term WEGO means that both sides determine their moves, and then they are simultaneously played out during the movement and battle phase. 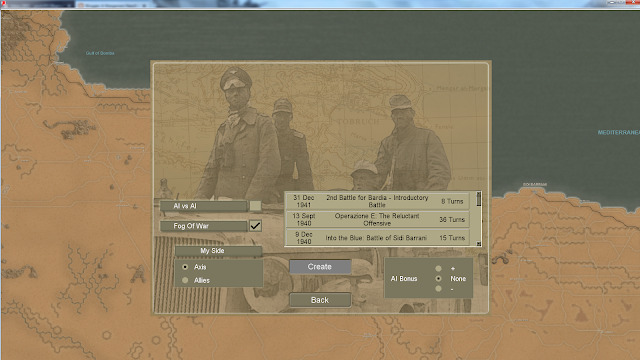 Board wargames have come a long way with simulating time and fog of war, but computer wargames are still better at it. The only thing that computer games cannot replicate is the ability to see the consternation in your opponent's eyes. The next item to notice about the game is the large amount of different scenarios that the game comes with. The game simulates the incredible difference in warfare from 1940 to 1942, not only the large difference in the armaments, but also how it was used. The third item about the game is that is has a lot of counters. I am talking a Grigsby game amount of counters. It seems funny that I have no problem, and actually enjoy, a board wargame with hundreds of counters. However, in computer wargames it is always nice to have an AI adjutant to hand things over to such as artillery fire etc. I can see where some gamers might have a problem with the amount of counters and data that a player must absorb in order to play the game correctly. The developer likes input from buyers, but also non-buyers. 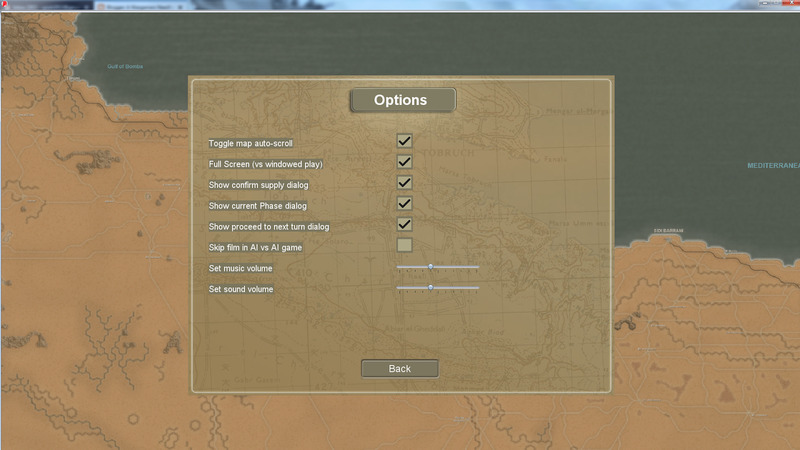 The game has been worked on continually from its first version until now. That is one of the biggest reasons to support different developers. I am not a big fan of the North African campaign so maybe it is that fact that has given me more pause than usual in digging into the game. So I am not truly ambivalent about the game. It is just that I have to be in the right state of mind to fire it up. It is not a game that you can start and then play for a half hour, and then head off to dinner. For this game I have to be ready to invest some time and to sink into my chair for a good long while. I am sure players of 'World in Flames', or 'War in the Pacific' will understand. I like the game, I just have to be ready to delve deeply into it. For those of you who like 'beer and pretzel' games, please stay far, far away. For anyone who is looking for a deep wargame, here it is. It is unbelievable to me that this started as a labor of love. This was a free download once. The game has come a long way since then, but it's still really only a hobby project. For everything that the developer has added into the game this is still hard for me to grasp. If you noticed, the review is late. I waited for the first patch to see if some items cleared up. I was having 'artifacts' show up on my screen after playing for a while (an artifact is a left over portion of a window that has since been closed). After seeing that no one else was complaining of this, I updated my drivers etc., and it no longer shows up. The AI in the game was another matter. 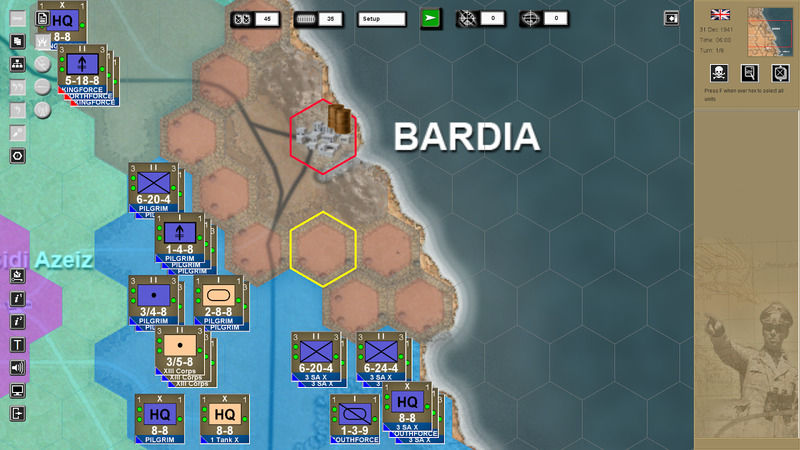 In some of the scenarios the AI would not really attack at all. The developer has worked on this and has said that he would continue to look at the AI. It does seem to be better after the patch. The other thing is this review seems to be cursed, at least for me. I have lost the rough draft twice on it, which is funny because it has never happened to me before. So, bottom line, this is a good to great game as long as you are interested in putting the time into learning it. One good thing about the game is the number of tutorials that have been done. Some of the best have been done by "Slick Wilhelm" from the Matrix Games forum.